It was 11:15 am when I entered Cinema 2 of Trinoma. The crowd spilled in all its alleys. True to its SRO anticipation,the theater management provided monobloc chairs even right in front of the screen. 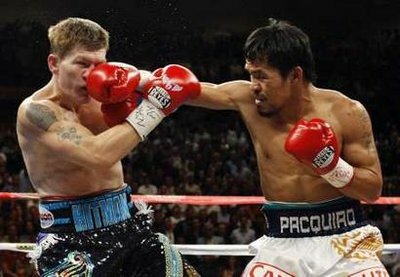 It was the latest fight of the warrior from Dadiangas, the best ex-future congressman General Santos City never had, Manny The Pacman Pacquiao. What drives Manny fearless in the ring? Doubtless, it is his abiding faith. His faith in his destiny and his god made Manny the best of the best, pound for pound, in his category. His antagonist, Juan Miguel Marquez, is an equally brilliant pugilist, never unmindful of the instructions of his seconds. Both, incidentally, have the same God. While Marquez has got everything it took, Pacquiao, on the other hand has that undefined faith of divine protection from his heavens. Upon entering the ring, we see the familiar and too original Pacquiao genuflection. With it, the pugilist summons all the spirits astray in the universe to once again envelop him and fill the empty recesses of his arsenal of might. With it, the Pacman emerges as a new man: invincible, determined, hungry, and never unlike the Crusader, with the singular mission of retrieving his own Holy Grail.That center square is his cosmos, it is his church. All the gods conspire to hand him his legendary victories, one after another. The Pacman’s punch wallops with all the collective heave-ho of everyone of us. Each of his punches releases some catharsis from all of us. Each of his bruises miraculously heals itself. His foe’s counter punch was just a cinematic effect. Just like the deathless cartoon character, our Pacman can never go wrong. I have never seen nor heard in all my lifetime the roar of a teary eyed crowd upon seeing the levelled Mexican. The Pacman would never go down. It was presumptuous and stupid for Quinito Henson to tell us all to pray for the Pacman’s deliverance in the 8th round. No, the Pacman will prevail. And indeed he did. Pacquiao no longer needs our collective entreaties. He already had them in his bosom. As Anton Chekhov said, faith is an aptitude of the spirit, simply a talent; you must be born with it. Just like every other fight, the champion hurried up his corner, as if climbing up his own Everest, and with eyes closed, mutters prayers of thanksgiving to his Almighty. We are all lost in our rambling voyage. Where exactly are we going? Manny the Pacman provides us a simple lighthouse perched on his angular face. It is his faith in something far greater than him. It is his consuming dedication of slaying that gnawing dragon in our collective underbellies. He knows that we have all that it takes. He believes in that smoldering fire in our guts. “Our faith is faith in someone else’s faith,” reminds US President William James. Now, at least we have something to start on.